As briefly mentioned last week, I was invited to be on a panel at the Environmental Action Conference in Randolph, Vermont last Saturday. The panel was about river repairs in Vermont after hurricane Irene, and the problems associated with removal of gravel and other sediment from waterways. The other people on this panel were Louis Porter of the Conservation Law Foundation and Kim Greenwood of the Vermont National Resources Council. The session seemed very short, but I did get to show my video demonstrating the perils of improperly channelized rivers, which was a big hit. There was time for some good conversation. In particular, one person wondered whether it were possible to continue 'sustainable' gravel mining at a modest level, similar to what has been done in the past. I find the idea intriguing, but am very skeptical that it is a good idea. Unlike the trees in a well-managed woodlot, gravel in a river is not 'growing' in place, but rather is moving downstream during floods. Removing gravel from one spot can lead to erosion both upstream and downstream, and if gravel removal destroys a house or causes rampant erosion, I would not classify it as sustainable. There were cases after Irene where sediment was removed to protect structures as a lesser of two evils, but there were also cases where overzealous river work may have actually increased future flood risk. Now that the storm is gone we need to think long and hard about our next steps. The idea that gravel mining can reduce flood risk is widespread in the minds of old-time Vermonters, and while I think the balance of evidence leans strongly towards not removing gravel from rivers, there is a lot of validity to the concern that some rivers in Vermont are building up increasing amounts of sediment. Vermonters know their rivers, and if they notice changes, policymakers should spend the time to listen (as many have). Excessive sediment in Vermont rivers is almost always linked to problems in the upper watershed. 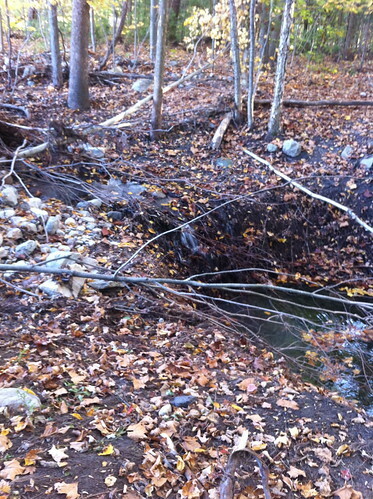 Improperly built roads channel and speed up water, and small, improperly placed culverts concentrate water and can wash out, leading to massive amounts of erosion. As many rural areas of Vermont become more populated, and long driveways are built across hillsides, many problems are appearing downstream. Digging gravel out of a river, however, is the hydrologic equivalent of running into a house fully engulfed in flame and tossing burning wood out of the house - towards other homes. Anyone who's ever dug a hole in saturated sand can tell you that the hole quickly caves in, and the same happens with river channels cut into gravel or sand. The real solution is in addressing the 'root' of the problem. 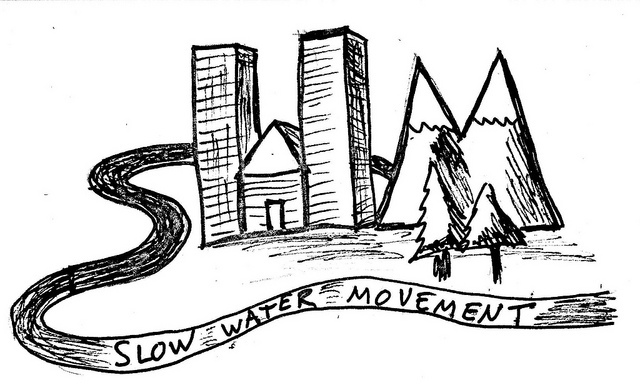 What we need to see is more watershed associations, more awareness in upstream residents, and accountability if someone upstream is causing harm to someone downstream. Also important: policymakers are quick to explain why gravel mining is a bad idea, and very willing to use the legal structure to enforce that gravel mining doesn't occur. What I'd like to see more of is people demonstrating WHY gravel mining is a bad idea. Most people don't want to hurt others, and won't do something willingly that will endanger someone else... but people are also skeptical of outsiders telling them that their well-established actions are wrong. I'd like to see more outreach about the issue in Vermont and other areas, and more honest and open dialog. It's also important to recognizes that there are exceptions to every rule, especially in the case of rivers, and that there were cases after Irene where gravel really did need to be removed from a river. So, in short, the conference reinforced my belief that efforts to share information with the general public, such as this blog, are important. To those people who attended the conference and the session (and the later session about the health of Lake Champlain), thanks so much for attending, participating, listening, and sharing your ideas! I enjoyed meeting a lot of neat people, and hope to see many of you around Vermont in the future. I was sad to miss the last part of the conference, but I was quite nervous about driving over two passes on storm-damaged roads in the snow. Thankfully, I made it home before the storm. East Middlebury, by the way, only picked up an inch or two of snow. My most recent Addison County Independent weather blog post was about the computer models used to create weather forecasts, and about how they often were the cause of 'busted' forecasts or last-minute forecast changes. Specifically, early-week forecasts called for snow in Addison County last night, but by midweek the snow was removed from the forecast in most areas. In the end, the truth fell somewhere between these two forecast extremes - snow fell in my location but did not 'stick' except on a few especially cold surfaces like the tops of cars and dry logs. In the mountains, and to the south in Rutland County, more substantial snow fell - several inches in some places. 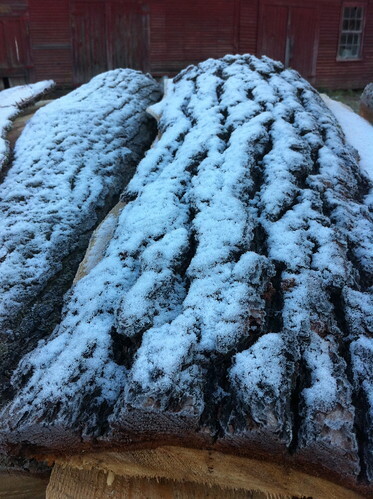 Above: light snow accumulation on some stacked wood in East Middlebury. For the most part, no measurable snow fell here. Last week I wrote a post speculating about possible effects of autumn leaves on the flow of rivers and streams. I noticed that the leaves were forming small dams in slow water and decreasing flow rate, but that during a flood, the leaves would quickly be washed away. 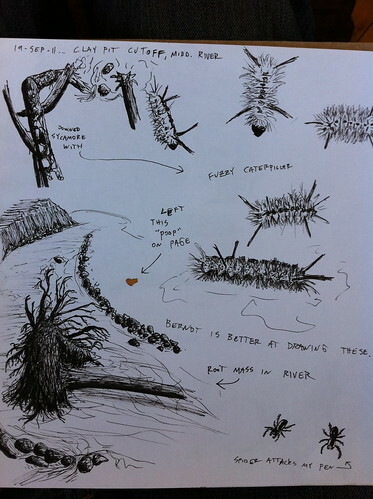 Since that time, I have come across some new research on much more profound effects that trees and other plants have on rivers. Recent evidence suggests that plants offer much more than just a minor role in affecting river flow. In fact, when plants like ferns, trees, and grasses colonized the land many millions of years ago, they changed the very nature of how rivers flow. October has been warmer than average in Vermont so far, but the month is going to leave us with a chill. Later this week a cold storm will come blasting through Vermont, and as it leaves the state it may blast us with some snow - one or two slushy inches in the lowlands, several inches in the mountains. Light snow is not all that unusual for late October, but because it has been warmer than average, it will seem like an abrupt change. One way or another, the storm will usher us into a time known by some as 'stick season'... once the light snow melts away, the trees will mostly be left bare, a forest of sticks over a layer of leaves, with the only color in the woods provided by the bright orange worn to prevent humans and dogs from being mistaken for deer during hunting season. 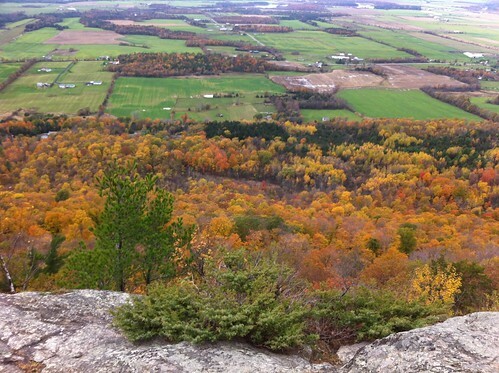 Above: This late October color, as seen from Snake Mountain near Virgennes, will soon be stripped from the trees by wind or wet snow. Speaking of weather, I've been invited to write occasional blog posts about Addison County's weather for the Addison County Independent online page. You can see my posts here. I also may be on a panel at the Environmental Action 2011 conference in Randolph, VT this Saturday. I'd be discussing issues associated with gravel removal from rivers and post-Irene flood repairs, along with Kim Greenwood of VNRC and Louis Porter, the Lake Champlain Lakekeeper. I hope to have some discussion about how channelization and dredging of rivers is not only an environmental issue but also a threat to safety and a cause of increased flooding in the long term. I may also talk a bit about my experiences during Irene. I was very lucky, unlike many others in Vermont, in that I did not experience property damage... but I still experienced a very discomforting afternoon and night where I had to leave our home without warning, and spent time in a shelter wondering if our home was damaged or destroyed. After returning home, I experienced quite a bit of concern when a knee-jerk river channelization effort possibly increased the risk of flood wall failure near my home (the flood wall has since been fixed, but significant issues remain and are undergoing long-term community discussion). In any event, if you're at the conference, come by - see here for more info. Autumn has come to Addison County. Many of the trees along the Middlebury River are covered in colorful leaves. Some of the leaves find their way into the river, where they float downstream, occasionally finding themselves clogged in 'leaf jams'. I found myself wondering if this has an effect on water flow. In the weeks since East Middlebury experienced flooding caused by Tropical Storm Irene, I've been watching a geologic and hydrologic event in progress on the Middlebury River. When rivers flow through relatively flat areas, they tend to meander. Meanders grow in size as the river erodes away the 'outside' part of the bend (the side that momentum directs the water towards) and deposits sediment on the 'inside' part of the bend. Over time, the meanders become more and more convoluted, until the meander grows so large that it cuts back towards itself. The river then shifts course to 'cut off' the majority of the meander, often leaving a lake or wetland in the abandoned river channel. The meanders are called oxbows, and are commonly found on natural, slow-moving watercourses of all sorts. There is a good description of the process here on Wikipedia. Below is a Google aerial photo of part of the Middlebury River (not the part I have photos and drawings of, but in this area it is easier to make out the river bends). You can see many bends including one that has recently cut off, which is at lower right. 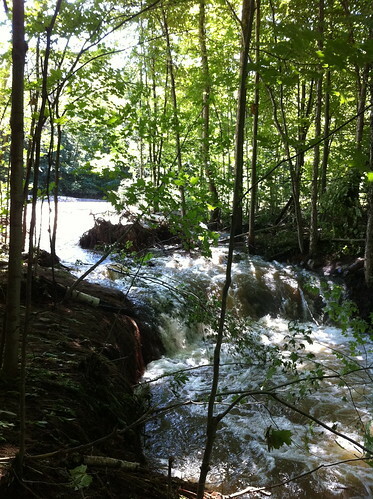 With the bend near my home, Irene was able to ALMOST cut through the bend, but didn't quite finish the job. On the upstream side, the bend cut towards west, and on the downstream side of the bend erosion from water that spilled over the flood plain began eroding backwards and creating a new channel. The result was a small new branch of the river that cuts across the 'neck' of the bend, with a deep pool in its upstream portion, and a chunk of dirt about 30 feet long that keeps the main force of the river out of its potential new channel... for now. 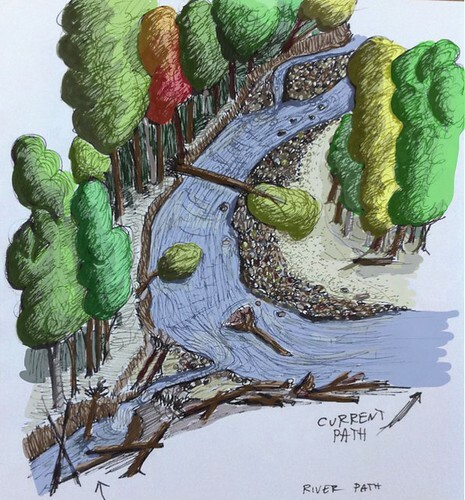 Below is a sketch I made to illustrate the current status of the cut. The river flows from the background and bends towards the right, and on the lower left you can see the new river path forming. Notice all the tree roots in the eroding area. They are doing an excellent job of holding the soil in place, and since the river has not risen much since Irene, very little additional erosion has occurred here. I think it will be surprisingly resilient to erosion, but I think the next big flush of water (perhaps the spring thaw) will probably cause most or all of the river to divert down this path. See here for an album of photos. I'll be adding more over time. I'll keep watching the oxbow. Hopefully I can catch it right after it breaks and get good photos of the river in action! Further forward in time, the abandoned stretch of river will turn into floodplain forest, and will continue to absorb and slow down floodwaters and act as a filter to remove sediment from the river. It's a beautiful, sunny, blustery day here in Addison County, Vermont. However, tonight we are going to experience a taste of winter as temperatures are expected to dip into the high 20s. I won't say more because I may have a post in a different blog about the subject... except that if you still have sensitive plants outside or remnant garden crops to pick, now is the time to do so. Above: fall color near Ripton, Vermont last week. 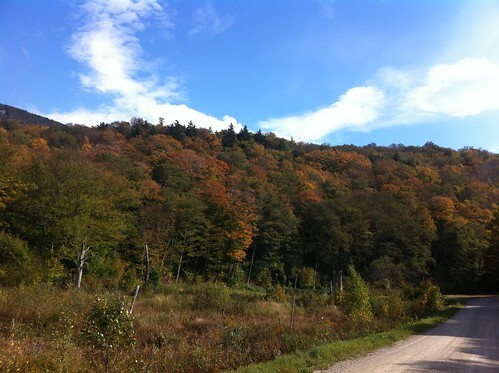 This week's frost will speed up foliage color change at lower elevations of Vermont. Meanwhile, a strong early-season winter storm is currently impacting all of California. On average, the first rains generally come to southern California around Halloween, so this storm is a bit earlier. Further north the rainy season starts earlier, but the storm has still been stronger than average, with several areas reporting more than an inch of rain. The Sierras are getting early season snowfall. The storm seems to be dousing much of Santa Barbara and Ventura counties and Malibu, with over an inch of rain in the last 24 hours in much of these areas. I expect the Los Angeles area will get much the same or a bit less. Snow is possible in the mountains. Here's a map of 24 hour rain totals in the area, but note that it updates automatically so if you click on this a few days after the storm, you should scroll to the bottom of the picture and select '7 day totals' (no other rainfall is likely in this area this week). Because Southern California gets little or no rain over the summer, the first cold-season storm encounters filthy, oily roads. The first storm creates VERY slippery conditions on roads, and also unfortunately washes a lot of pollution into local waterways and the ocean. Rain barrels and rain gardens are especially useful in these conditions - the dry soil will soak up runoff if it gets a chance, and an inch of rain will usually completely fill any rain barrel. If the rest of the fall is dry, you will need that water for your plants. Click here for a radar loop of the storm thus far, if I get a chance I'll update later with one that will show later rain as well. So.... we dam up or dry up mountain streams, ship water hundreds of miles, devastate aquifers, kill salmon and render thousands of farmers unemployed for our urban water. We transport and filter it using an extremely energy-intensive process, then we dump millions of gallons of potable water (something most in the world don't even have access to) all over a 'crop' we don't eat, burn, or feed to animals. We maintain our lawns using machines that create a great deal of air pollution and consume fossil fuels. Then, irrigation water and other runoff from lawns ends up in local waterways, bringing with it fertilizers, pesticides, and other pollution. I remember hearing once that in the summer, most of the water in lower Malibu Creek in California can be tagged via isotope analysis as water from SNOWMELT - snow in the Malibu Creek watershed is a once in a decade event and generally amounts to a dusting to one inch. The water in the creek is from the Sierras, the Rockies, the southern Cascades... shipped hundreds of miles to end up, polluted, in a creek populated by species that are adapted to dry conditions and can't even use the water. Lawns are wholly irrational and ridiculous, enact large social and environmental costs, and waste space that could be used for other things - vegetable gardens, micro-habitat patches of native plants, stream restoration, you name it! Oddly, it's done entirely via an odd form of adult peer pressure (sometimes legally enforced via ridiculous HOA regulations). I understand it often isn't legally or socially possible to rip out your lawn. That being the case, we need to address this on a large scale, all at once. There needs to be a movement to remove all of the lawns of the West, except for shared sports fields and parks. If we don't do it now, we surely will have to do it later, during the next drought - and we'll end up with a bunch of brown, flammable grass everywhere instead of something better. If you live in southern California, here's one resource for removing your lawn. Native plants are one great choice - cacti and succulents, or a vegetable garden, are also excellent choices. Replacing your lawn with pavement or a 'rock garden' of crushed gravel isn't really much of an improvement, as it creates severe runoff problems. You want soil... just not lawn. Out east, there's plenty of water for lawns, but they still require a lot of maintenance and are a cause of water and air pollution. Consider a vegetable garden, a rain garden, wildflowers, or conversion back to a (managed) forest understory system. With the latter, you will have wildlife using your yard and can even generate a bit of sustainable firewood and perhaps maple syrup. I've noticed some unusual runoff patterns in East Middlebury, VT. Rather than flowing into drains, or behind houses, runoff water in East Middlebury runs west along the main roads for long distances, often puddling on sidewalks or in the road. 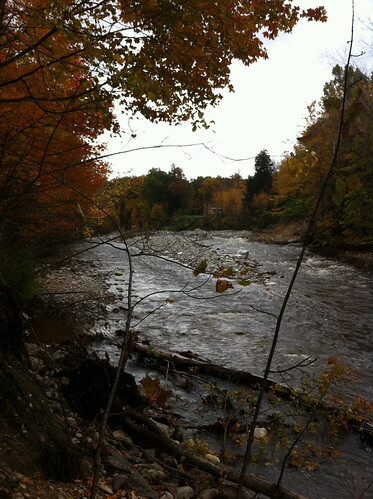 During Hurricane Irene, the water flowing down East Main and Ossie streets was not only fed by local runoff, but by the overflowing Middlebury River as well. Hopefully that does not happen again, but even when the river is not on the road, small 'creeks' form in places when the rain is heavy. When it gets below freezing, puddles on the sidewalk and street freeze, causing problems. 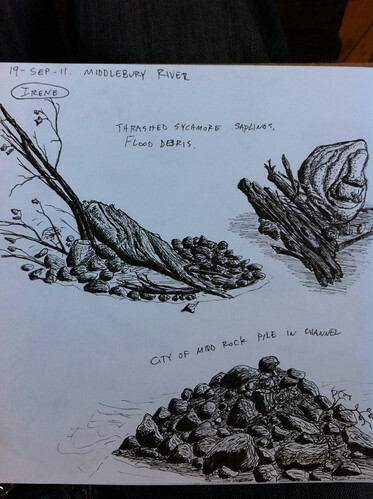 The soil in East Middlebury is old sand from a glacial delta as well as newer sand and cobble deposits from the river. As such, it is very well drained - aside from the river and a few larger streams, you don't see surface runoff in areas of uncompacted soil, even during downpours (an exception is in early spring when the ground is frozen, of course). Water running off of drainspouts soaks into the ground almost immediately, is filtered as it passes through the sand to an underlying clay layer, and makes it into the river long after the rain has stopped. Rain gardens on drainspouts aren't really necessary here, but when it comes to water channeled down the road (there are no gutters so it runs right down the road and sidewalk), I can see a lot of value in diversion of this water into small rain gardens or swales. All of the water flows roughly from east to west (from right to left). Brown lines represent water running down pavement or sidewalk, the green line is a soft-bottomed ditch that does allow some water to soak in (but would work better if it were a bit wider), and the blue line is a small creek that drains the area north of town. In a few places the water runs into drains, but mostly these are blocked. The areas of water flowing down the road are quite substantial. The 'stream' flowing down Ossie Road is almost a half mile long! This water flows down the road, picking up pollutants, rushing towards the river, and possibly flooding basements, and at one point branching off and wandering down a driveway (not pictured), instead of being diverted to where it can soak in. There is clearly the potential to do something better with this water. I also took lots of pictures. A map including these pictures is here (unfortunately I don't have an easy way to get them onto Google Earth). Take a virtual tour!